Purpose: Preclinical studies were performed to examine the interaction of the hypoxic cell toxin tirapazamine (TPZ), a benzotriazine di-N-oxide, with several chemotherapeutic agents, including carboplatin, cyclophosphamide, doxorubicin, etoposide, 5-fluorouracil (5-FU), taxol, and navelbine. Methods: The modification by TPZ of the antitumor drug activity and the effect of schedule were determined with an in vivo/in vitro clonogenic assay using well-established RIF-1 murine tumors transplanted into C3H mice. Results: Additive, or greater than additive, tumor cell killing was observed when TPZ was combined with carboplatin, cyclophosphamide, doxorubicin, etoposide, 5-FU and taxol. With the exception of 5-FU there were only small, or no, enhancements of the systemic toxicities of the drugs by TPZ. The greatest enhancement of antitumor activity was with carboplatin, with the maximum effectiveness when TPZ was given 2–3 h before the carboplatin. The activity of cyclophosphamide, doxorubicin, etoposide and taxol were most enhanced when TPZ was given 24 h before the drug. Additional investigations with three-drug combination treatments using cisplatin and TPZ with either etoposide or navelbine indicated a substantial therapeutic gain from the addition of TPZ. 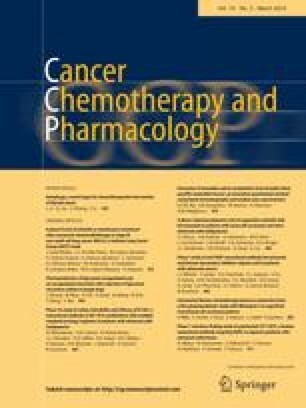 Conclusions: The data for each of the drugs tested in combination with TPZ, with the exception of 5-FU, indicate that potential clinical benefit may be obtained from therapies combining TPZ with conventional chemotherapy.